This article is about the drilling rig. For the explosion, see Deepwater Horizon explosion. For the oil spill, see Deepwater Horizon oil spill. For the 2016 film, see Deepwater Horizon (film). For other related articles, see Deepwater Horizon (disambiguation). Deepwater Horizon semi-submersible drilling rig. Deepwater Horizon was a fifth-generation, RBS-8D design (i.e. model type), deepwater, dynamically positioned, column-stabilized, semi-submersible mobile offshore drilling unit, designed to drill subsea wells for oil exploration and production using an 18.75 in (476 mm), 15,000 psi (100,000 kPa) blowout preventer, and a 21 in (530 mm) outside diameter marine riser. Deepwater Horizon was the second semi-submersible rig constructed of a class of two, although Deepwater Nautilus, its predecessor, is not dynamically positioned. The rig was 396 by 256 ft (121 by 78 m) and capable of operating in waters up to 8,000 feet (2,400 m) deep, to a maximum drill depth of 30,000 ft (9,100 m). In 2010 it was one of approximately 200 deepwater offshore rigs capable of drilling in waters deeper than 5,000 ft (1,500 m). Its American Bureau of Shipping (ABS) class notations were "A1, Column Stabilized Drilling Unit, AMS, ACCU, DPS-3". In 2002, the rig was upgraded with "e-drill", a drill monitoring system whereby technical personnel based in Houston, Texas, received real-time drilling data from the rig and transmitted maintenance and troubleshooting information. Advanced systems played a key role in the rig's operation, from pressure and drill monitoring technology, to automated shutoff systems and modelling systems for cementing. The OptiCem cement modelling system, used by Halliburton in April 2010, played a crucial part in cement slurry mix and support decisions. These decisions became a focus for investigations into the explosion on the rig that month. Deepwater Horizon was built for R&B Falcon (which later became part of Transocean) by Hyundai Heavy Industries in Ulsan, South Korea. 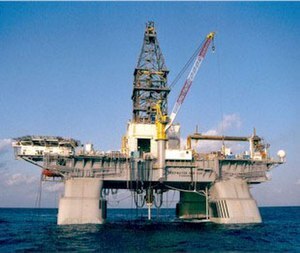 Construction started in December 1998, the keel was laid on 21 March 2000, and the rig was delivered on 23 February 2001, after the acquisition of R&B Falcon by Transocean. 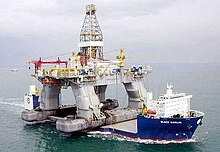 Until 29 December 2004 the rig was registered in the Republic of Panama. Transocean, through its Steinhausen, Switzerland subsidiary Triton Asset Leasing GmbH, operated the rig under the Marshallese flag of convenience. The rig was leased to BP on a 3-year contract for deployment in the Gulf of Mexico following construction. The lease was renewed in 2004 for a year, 2005 for 5 years, and 2009 for 3 years covering 2010 to 2013. The last contract was worth $544 million, or $496,800 a day, for a "bare rig", with crew, gear and support vessels estimated to cost the same. According to R&B Falcon's filings to SEC in 2001, the transfer document between R&B Falcon and Transocean was dated 17 August 2001, and the rig was specified as "official registration number of 29273-PEXT-1, IMO number of 8764597, with gross tonnage of 32,588 and net tonnage of 9,778" and the transfer value as US $340 million. As of 2010[update], the rig was insured for US $560 million covering the replacement cost and wreckage removal. Deepwater Horizon worked on wells in the Atlantis (BP 56%, BHP Billiton 44%) and Thunder Horse (BP 75%, ExxonMobil 25%) oil fields. It was described at times as a "lucky" and "celebrated" rig, and in 2007 was still described as "one of the most powerful rigs in the world". In 2006 it discovered oil in the Kaskida oil field, and in 2009 the "giant" Tiber field. The well in the Tiber field has a vertical depth of 35,050 ft (10,683 m) and a measured depth of 35,055 ft (10,685 m), below 4,132 ft (1,259 m) of water. The well was the deepest oil well in the world, and more than 5,000 feet (1,500 m) further below the seabed than the rig's official drilling specification stated on the company's fleet list. In February 2010, Deepwater Horizon commenced drilling an exploratory well at the Macondo Prospect (Mississippi Canyon Block 252), about 41 miles (66 km) off the southeast coast of Louisiana, at a water depth of approximately 5,000 feet (1,500 m). The Macondo prospect exploration rights were acquired by BP in 2009, with the prospect jointly owned by BP (65%), Anadarko (25%) and MOEX Offshore 2007 (10%). Deepwater Horizon was still working on the Macondo site on 20 April 2010, when a violent explosion occurred leading to destruction of the rig and resulting oil spill. The well was in the final stages of completion at the time; its cement casing was injected and hardening, and the rig was due to move shortly to its next role as a semi-permanent production platform at the Tiber site followed by a return to the Kaskida field; squatting semi-permanently over an oil dome 50 miles off the coast of Louisiana. The exploratory work was described as "concluded" and permission had already been requested from MMS to terminate operations at the Macondo site. During its operational lifetime, the rig was actively in operation for 93% of its working life (2,896 of 3,131 days). The remainder partly relates to time spent between sites. The Minerals Management Service (renamed on 18 June 2010 to the Bureau of Ocean Energy Management, Regulation and Enforcement, or Bureau of Ocean Energy (BOE)) is the regulatory and inspecting body for offshore oil drilling and rigs in the United States of America. According to an Associated Press investigation, certain safety documentation and emergency procedure information, including documentation for the exact incident that later occurred, was absent. The exact number of required monthly inspections performed varied over time; the inspections were carried out as required for the first 40 months, but after that around 25% of inspections were omitted, although the investigation notes this is partly expected, since there are circumstances such as weather and movement which preclude an inspection. Reports of the last three inspections for 2010 were provided under Freedom of Information legislation. Each of these inspections had taken two hours or less. During its lifetime the rig received 5 citations for non-compliance, 4 of which were in 2002 (safety, including the blowout preventer) and the other in 2003 (pollution). A sixth citation in 2007 related to non-grounded electrical equipment was later withdrawn when the equipment was determined to be compliant with regulations. 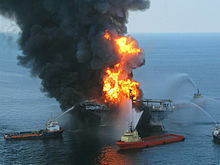 Overall the Deepwater Horizon's safety record was "strong" according to a drilling consultant reviewing the information. In 2009 the Minerals Management Service "herald[ed] the Deepwater Horizon as an industry model for safety". According to AP's investigation "its record was so exemplary, according to MMS officials, that the rig was never on inspectors' informal 'watch list' for problem rigs". At the time of the explosion, there were 126 crew on board; seven were employees of BP, 79 of Transocean, there were also employees of various other companies involved in the operation of the rig, including Anadarko, Halliburton and M-I SWACO. Eleven workers were presumed killed in the initial explosion. The rig was evacuated, with injured workers airlifted to medical facilities. After approximately 36 hours, Deepwater Horizon sank on 22 April 2010. The remains of the rig were located resting on the seafloor approximately 5,000 ft (1,500 m) deep at that location, and about 1,300 ft (400 m) (quarter of a mile) northwest of the well. The resultant oil spill continued until 15 July when it was closed by a cap. Relief wells were used to permanently seal the well, which was declared "effectively dead" on 19 September 2010. Transocean received an early partial insurance settlement for total loss of the Deepwater Horizon of US $401 million around 5 May 2010. Financial analysts noted that the insurance recovery was likely to outweigh the value of the rig (although not necessarily its replacement value) and any liabilities – the latter estimated at up to US$200 million. Litigation, ultimate roll call of damage, and the scope of final insurance recovery were all unknown as of June 2010[update], with analysts reporting that the aftermath was of unprecedented scale and complexity compared to previous disasters which themselves took many years to unfold and resolve. A July 2010 analysis by the Financial Times on the aftermath cited legal sources as saying that "at some point the scale of the litigation becomes so large that it really is novel", that "the situation is likely to be complicated further because the variety of probable cases means it will be hard to aggregate them into so-called class actions" and that there was "no way to put this in historical context because we have never faced anything like this before". As with the Exxon Valdez disaster, litigation was being discussed in terms of a 20-year timescale. In January 2013, Transocean agreed to pay US$1.4 billion for violations of the US Clean Water Act. BP had earlier agreed to pay $2.4 billion but faced additional penalties that could range from $5 billion to $20 billion. In September 2014, Halliburton agreed to settle a large percentage of legal claims against them by paying $1.1 billion into a trust by way of three installments over two years. On 4 September 2014, U.S. District Judge Carl Barbier ruled BP was guilty of gross negligence and willful misconduct under the Clean Water Act (CWA). He described BP's actions as "reckless," while he said Transocean's and Halliburton's actions were "negligent." He apportioned 67% of the blame for the spill to BP, 30% to Transocean, and 3% to Halliburton. BP issued a statement strongly disagreeing with the finding, and saying the court's decision would be appealed. On 8 December 2014, The US Supreme Court rejected BP's legal challenge to a compensation deal over the 2010 Gulf of Mexico oil spill. The settlement agreement had no cap, but BP initially estimated that it would pay roughly $7.8bn (£6.1bn) to compensate victims. ^ a b "Transocean Ltd., Form 10-K, Annual Report, Filing Date Feb 24, 2010". secdatabase.com. Retrieved 15 May 2018. ^ a b Deepwater Horizon Marine Casualty Investigation Report (PDF) (Report). Office of the Maritime Administrator. 17 August 2011. Retrieved 25 February 2013. ^ "Transocean Ltd. Provides Deepwater Horizon Update" (Press release). Transocean Ltd. 26 April 2010. Retrieved 21 May 2010. ^ "Deepwater Horizon: A Timeline of Events". Offshore-Technology. Net Resources International. 7 May 2010. Retrieved 21 May 2010. ^ a b c "Fleet Specifications: Deepwater Horizon". Transocean. Archived from the original on 19 June 2010. Retrieved 9 June 2010. ^ a b c d "ABS Record: Deepwater Horizon". American Bureau of Shipping. 21 March 2000. Retrieved 9 June 2010. ^ "Fleet Specifications: Deepwater Horizon". Transocean. Archived from the original on 19 June 2010. Retrieved 9 June 2010. ^ "Deepwater Horizon contract extended". Offshore Magazine. PennWell Corporation. 1 November 2009. Retrieved 22 April 2010. ^ "Transocean's Ultra-Deepwater Semisubmersible Rig Deepwater Horizon Drills World's Deepest Oil and Gas Well" (Press release). Transocean. 2 September 2009. Archived from the original on 26 April 2010. Retrieved 7 June 2010. ^ "BP Makes Giant Deepwater Discovery with Tiber". Rigzone. 2 September 2009. Retrieved 29 June 2010. ^ Crittenden, Guy (10 May 2010). "Understanding the initial Deepwater Horizon fire". HazMat Management. Retrieved 20 June 2010. ^ Staff and wire (27 May 2010). "Gulf oil spill now largest offshore spill in history as BP continues plug effort". USA Today. Retrieved 9 June 2010. ^ "Rig Data Centre". Rigzone. 28 May 2010. Retrieved 28 May 2010. ^ "Monitoring system reduces rig downtime". Offshore Magazine. PennWell Corporation. 1 November 2002. Retrieved 22 April 2010. ^ "BP oil spill 'slows' but serious IT failures come to surface". IT news website. Computerworld UK. 28 May 2010. Retrieved 12 November 2010. ^ "Deepwater Horizon modelling software showed BP cement conditions unstable". IT news website. Computerworld UK. 12 November 2010. Retrieved 12 November 2010. ^ a b "Transocean Ltd. Provides Deepwater Horizon Update". The Wallstreet Journal. 26 April 2010. ^ "Entry for Triton Asset Leasing GmbH". Moneyhouse.ch "Commercial register and company data". Retrieved 23 June 2010. ^ "Transocean Inc 10-K filings, Exhibit 21: Subsidiaries (SEC File 333-75899, Accession Number 1140361-7-4583)". SEC EDGAR database, for the U.S. Securities and Exchange Commission. Retrieved 23 June 2010. ^ a b Reddall, Braden (22 April 2010). "Transocean rig loss's financial impact mulled". Reuters. Retrieved 1 May 2010. ^ ["Deepwater Horizon launched by TSF" Check |url= value (help). 'Offshore Deepwater Horizon launched by TSF] magazine. 1 June 2001. Retrieved 23 June 2010. ^ "Transocean Receives Contract Extensions for High-Specification Rigs Discoverer Enterprise and Deepwater Horizon". Business Wire. 26 April 2004. Retrieved 23 June 2010. ^ "Transocean Inc. Announces Contract Awards for Two High-Specification Semisubmersible Rigs". Business Wire. 28 April 2005. Retrieved 23 June 2010. ^ "The Well". The Houston Chronicle. 17 October 2009. Retrieved 22 April 2010. ^ a b Bartley J. Eckhardt, PE; Arthur Faherty (20 May 2010). "Forensic Anatomy of the Events on the Deepwater Horizon" (PDF). Robson Forensic. p. 8. Retrieved 23 June 2010. ^ a b c "R&B FALCON CORP, Form 8-K, Current Report, Filing Date Aug 31, 2001". secdatabase.com. Retrieved 15 May 2018. ^ Bergin, Tom (17 June 2008). "BP's Thunder Horse starts oil and gas production". Reuters. Retrieved 29 May 2009. ^ a b Washburn, Mark (14 May 2010). "A huff and boom ended Deepwater Horizon's good luck". The McClatchy Company. Retrieved 18 June 2010. ^ "BP & Partners Make Discovery at Kaskida Prospect in the Gulf of Mexico" (Press release). Anadarko Petroleum. 31 August 2006. Retrieved 24 April 2010. ^ a b "Deepwater Horizon Drills World's Deepest Oil & Gas Well" (Press release). TransOcean. 2 September 2009. Archived from the original on 28 April 2010. Retrieved 2 September 2009. ^ a b "BP drills oil discovery in the Gulf of Mexico". Offshore Magazine. PennWell Corporation. 2 September 2009. Retrieved 22 April 2010. ^ Braden Reddall (2 September 2009). "Transocean says well at BP discovery deepest ever". Reuters. Retrieved 22 April 2010. ^ "Transocean's Deepwater Horizon drills world's deepest oil and gas well". Red Mist Media. Retrieved 26 May 2010. ^ "Fleet Status Report". Transocean. 13 April 2010. Retrieved 9 June 2010. ^ "Macondo Prospect, Gulf of Mexico, USA". offshore-technology.com. 20 October 2005. Retrieved 9 May 2010. ^ "Central Gulf of Mexico Planning Area Lease Sale 206 Information". US Minerals Management Service. 8 August 2008. Retrieved 6 June 2010. ^ "Deepwater Horizon Still on Fire in GOM". Rigzone. 21 April 2010. Retrieved 21 April 2010. ^ a b Robertson, Cambell; Robbins, Liz (22 April 2010). "Oil Rig Sinks in the Gulf of Mexico". The New York Times. Retrieved 22 April 2010. ^ "BP confirms that Transocean Ltd issued the following statement today" (Press release). BP. 21 April 2010. Retrieved 21 April 2010. ^ "Gibbs: Deepwater Horizon Aftermath Could Affect Next Lease Sale". Rigzone. 30 April 2010. Retrieved 18 May 2010. ^ "UPDATED: Search Continues for 11 Missing Workers". RigZone. 22 April 2010. Retrieved 19 July 2010. ^ a b c d e f g h i j "Review: Oil rig inspections fell short of guidelines". Associated Press. 16 May 2010. Retrieved 24 June 2010. ^ a b "Salazar Swears-In Michael R. Bromwich to Lead Bureau of Ocean Energy Management, Regulation and Enforcement". Bureau of Ocean Energy Management, Regulation and Enforcement. 21 June 2010. Archived from the original on 26 June 2010. ^ Brenner, Noah; Guegel, Anthony; Watts, Rob; Pitt, Anthea (29 April 2010). "Horizon crew tried to activate BOP". Upstream Online. NHST Media Group. Retrieved 4 June 2010. ^ "Investigating the Cause of the Deepwater Horizon Blowout". The New York Times. 21 June 2010. ^ Richard Pendlebury (18 June 2010). "Daily Mail special investigation article: Why is BP taking ALL the blame?". Dailymail.co.uk. Retrieved 29 April 2012. ^ Resnick-Ault, Jessica; Klimasinska, Katarzyna (22 April 2010). "Transocean Oil-Drilling Rig Sinks in Gulf of Mexico". Bloomberg. Retrieved 22 April 2010. ^ "Deepwater Horizon Incident, Gulf of Mexico". National Oceanic and Atmospheric Administration, Office of Response and Restoration. 24 April 2010. Archived from the original on 29 April 2010. Retrieved 25 April 2010. ^ "Bird Habitats Threatened by Oil Spill". National Wildlife. National Wildlife Federation. 30 April 2010. Retrieved 2 May 2010. ^ "US Government: Deepwater Horizon Well Is Effectively Dead". 19 September 2009. Retrieved 19 September 2009. ^ Green, Meg (7 May 2010). "Transocean: Insurers Have Already Paid $401 Million for Deepwater Horizon Loss". Insurance news net. Retrieved 17 June 2010. ^ Fortson, Danny (9 May 2010). "Rig firm's $270m profit from deadly spill". The Sunday Times. London. Retrieved 17 June 2010. ^ a b Stempel, Jonathan (30 June 2010). "Special Report - BP oil spill a gusher for lawyers". Reuters Africa. Retrieved 19 July 2010. ^ Kam, Dara (29 June 2010). "Valdez expert: Psychological impact of Gulf oil spill won't fully emerge for years". palm Beach post news. Retrieved 19 July 2010. ^ "BP: Eagles and vultures". Financial Times. 1 July 2010. Retrieved 19 July 2010. ^ David Malakoff (3 January 2013). "Second Oil Spill Settlement Adds to Gulf Coast Science and Restoration Funding". Science News. Retrieved 4 April 2013. ^ "BP loses latest US oil spill appeal". "BBC News". 8 December 2014. Griffitt, Michelle. "Initial Exploration Plan Mississippi Canyon Block 252 OCS-G 32306" (PDF). BP Exploration and Production. New Orleans, Louisiana: Minerals Management Service. Archived from the original (PDF) on 5 July 2010.